The lavish display at the Eagle Square, Abuja, on Tuesday, which climaxed Nigeria’s 58 Independence Day celebration was absolutely unnecessary. For me, there is really nothing to celebrate. October 1 should have been a day for sober reflection, with so much hunger, disease, poverty, pain, malnutrition, insurgency, mass unemployment, decaying infrastructure and all the negatives you can think of, ravaging mother Nigeria. For 58 years, wicked civilians and military politicians combined to pauparise the masses of the people, turning our commonwealth into personal wealth. As a result, our dear country is miles behind her contemporaries on all development indices. 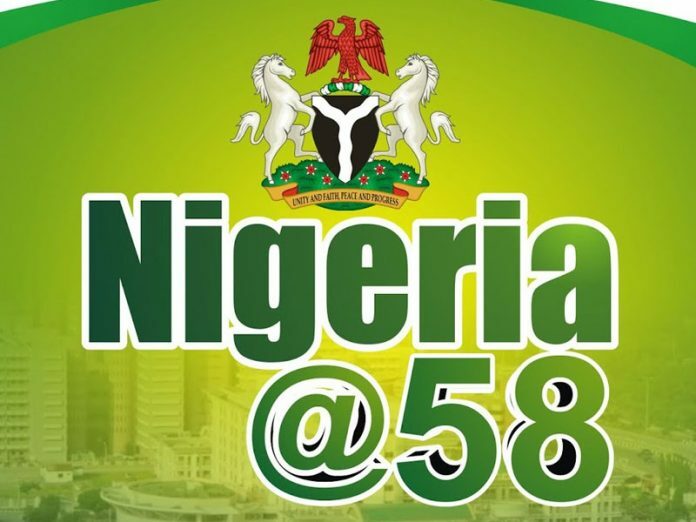 It is a big shame that after 58, Nigeria can’t provide quality healthcare in public hospitals, quality education in public schools and quality infrastructure to motivate development. Our leaders run abroad for healthcare and send their children overseas for quality education. In the year 2019, Nigeria is still struggling to provide uninterrupted electricity to its citizenry, while inner and outer roads remain largely tattered. The bulk of our commonwealth is stolen and stashed abroad. So, how will Nigeria develop? The last three years have been horrendous, with poverty assuming a frightening dimension. For the first time in a long while, inflation in Nigeria jumped to a double digit. Unemployment jumped to an unprecedented height. No wonder the British Prime Minister, Theresa May, openly branded Nigeria as “home to the poorest people in the world”. Yes, Nigeria is indeed World Poverty Capital. Our dear 58 years old Nigeria has overtaken India as the country with the largest number of extreme poor as of 2018, a report by the Washington-based Brookings Institution confirmed. So, what is there to celebrate? The October 1st charade was clearly a celebration of poverty. The International Monetary Fund in a report in March affirmed that poverty assumed an unprecedented height in Nigeria within three years of the Buhari administration. It reported that more Nigerians got poorer under Buhari’s watch. The IMF said Nigeria needed urgent economic reforms to stem the poverty. It is also pathetic that Nigeria is now ranked as one of the most dangerous countries to live in, in the world, and more unsafe than war-torn Libya, according to the 2018 Global Law and Order Report by the Gallup Poll. In the latest annual ranking of the safest and least safe countries by Gallup, Nigeria placed 116th out of 142 countries, with the index score of 66, which is lower than the global average score of 81. Nigeria ranked below African countries like Egypt, Rwanda, Mauritius, Morocco, Ethiopia, Tanzania, Niger, Zimbabwe, Burkina Faso, Kenya, and Togo in the law and order log. Nigeria also placed lower than violence-ridden Libya, the Central African Republic and Algeria. What a shame. Nigeria is evidently one of the most dangerous places to live in the world, with Fulani herders, Boko Haram, bandits and numerous unknown gunmen killing scores of people daily. What a country! Rather than address these challenges, the government went about celebrating on October 1. I also watched with dismay, the military displaying its so-called “might’ at the Eagle Square on October 1. 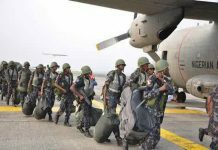 The Nigerian military that was once revered globally is now persistently humiliated by Boko Haram, bandits and herders. These days, stories of terrorists dislodging military posts pour. From Zari, to Bama, from Jilli to Gudumbali, the story is the same. The terrorists continue to overrun military posts. Majority of the industries that ought to help alleviate the poverty in Nigeria are gasping for survival. 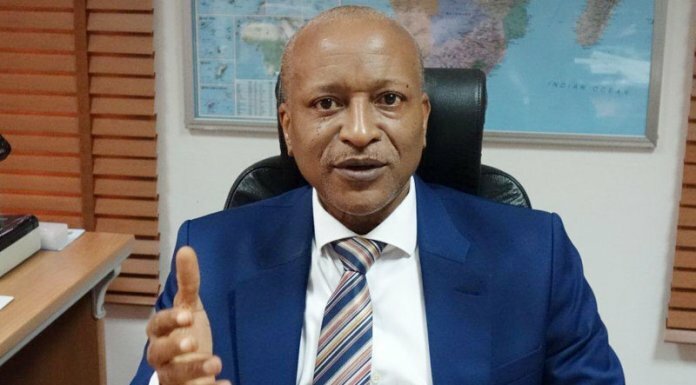 The Manufacturers Association of Nigeria (MAN), last week reminded the Buhari government that the country’s industrial sector is yet to record any growth for a long time. According to MAN, the development does not portend well for the country that is striving to make impact in the highly competitive global economy. 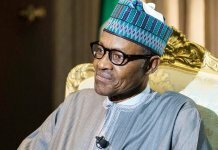 MAN said despite the alleged growth of the Nigerian economy in 2017, the challenges are not yet over as the manufacturing sector is still on the brink of recession and called on the government to take urgent steps to address the challenges facing the sector to enable it impact on the macroeconomic development of the country. The association’s national President, Dr. Frank Jacobs, said the situation of zero growth in the sector was an indication that a lot needed to be done by the government to rescue the sector from imminent collapse. Unfortunately, this is not a listening government. May Allah save Nigeria. This is the inglorious level Osun State degenerated to, under the leadership of Rauf Aregbesola. Today, I have decided to concentrate on the plight of these retirees. For over seven years, these seniors are persistently pummeled and humiliated by Aregbesola. In January last year, the aggrieved pensioners added a twist to their protest when they erected an Internally Displaced Pensioners camp at a strategic location in Osogbo, the first of its kind in the entire South-west. It was a sorry scene. This is the tragedy that has befallen Osun State retirees under the Aregbesola administration. This monumental tragedy has caused irreparable physically and psychological damages to the seniors and their families. The APC National Working Committee’s panel sent to conduct the Lagos governorship primary danced naked in public on Wednesday. It was a dance of shame by the Clement Ebri-led panel. 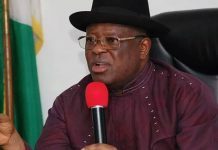 24-hours earlier, Ebri, a former governor of Cross River State, had on national television declared the voodoo Lagos governorship primary conducted on that day by the Lagos APC chieftains as a charade and subsequently cancelled the exercise. I can clearly remember Ebri saying that the preparatory process for the election had just been concluded and that his panel was shocked to hear that the primary had been concluded. He remarked on Tuesday: “The preparatory process had just been concluded for the primary. The primary is to begin anytime soon. There was no election today. Election materials are being sorted. The stage is set and election begins anytime from now. We have guidelines and we will stick to the guidelines. “We want an election that will be credible and in line with the guidelines, the extant rules and the laws of the country. And that is what we have done. We are ready to go to the field and execute this, so that at the end of the day, we will not be accused of partisanship. Lagos is very important to us and it is a flagship of the APC. That was Ebri speaking on Tuesday. I thought a transparent primary election would take place the following day. But Ebri made a world record reversal on Wednesday and accepted the result of an election he said was a travesty. In fact, he collected and signed it, declaring Jide Sanwoolu winner of the fraudulent primary. I have never seen this kind of a thing before in my life. It was a travesty of justice. So, what changed within 23 hours? Very simple: The Ebri panel got instruction from Abuja to accept and sign the manufactured result. The primary was simply skewed to favour Sanwoolu. My dear Ebri at his level could not resist these shenanigans. A man that had earlier distanced his panel from the charade was seen signing the jaundiced result. In fact, it was Tunde Balogun, chairman of the APC in Lagos State that declared Sanwoolu winner, when Ebri initially refused to do so. This same Ebri suddenly forgot about the equity and fairness he talked about on Tuesday and openly backed the farce. What a disgrace. So, this is the “change” APC promised Nigerians? A party that promised change is seen promoting a world record farce. It was a brazen disrespect for Justice and equity. The truth that must be told is that there was no governorship primary election on Tuesday. The result submitted was brazenly concocted to knock out Akinwunmi Ambode. It was a mockery of democracy. Lagosians know what to do in 2019.